Apple provides both iCloud and iTunes to sync data among different Apple devices including Mac computer, iPhone, iPad and iPod Touches. iCloud is every convenient, but it is not available if there is no network. Apple’s OS X operating system has enhanced the ability to sync content between your iOS device and Mac via a USB cable. If you prefer transferring content the old-school way, here’s a couple of different ways of how to sync contacts locally to your Mac through iTunes. > Click the Apple icon at the top left of your home screen and select About This Mac. If you’re not up to date, select Software Update from the same menu. > Connect your iOS device to your Mac via a USB charging cable. > Open iTunes. If iTunes asks for permission to sync with your device, select Continue. > Select your device from the top right of the iTunes interface. > Use the tabs at the top of the device screen to check off which content you’d like to sync. As you want to Sync Contacts in the Click Info tab and choose Contacts to Check Off. > Once you’ve chosen the content you want to sync, select Apply and then Sync from the bottom right of the iTunes screen. Also, you can search for a third party iPhone data recovery software to export all the contacts from the iTunes backup file you have created previously. 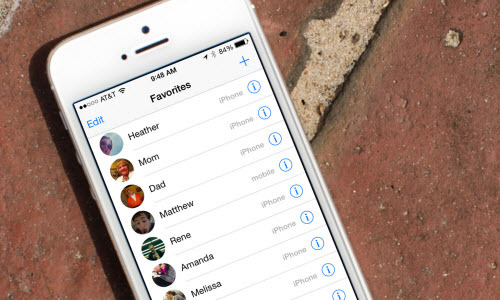 Here in this post, I would like to use iFonebox to demonstrate how to extract iPhone contacts from iTunes backup file. Note: iFonebox is available for both Windows and Mac version, please choose the right version to download and install. > Select an iTunes backup file from which you want to extract the iTunes backup file. > Choose Contacts to scan selectively. > Preview the exported contacts items and select whatever you need to recover to your computer. 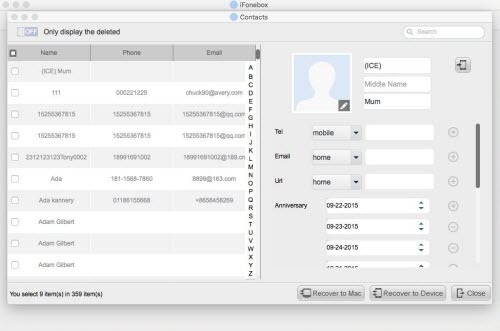 iFonebox will export all the contacts you need to three formats, CSV, VCF and HTML, you can import contacts to your Mac Contacts from the CSV and VCF file. This entry was posted in Backup/Back Up, iTunes, Tips and Tricks and tagged sync contacts through iTunes, sync contacts to mac OS X, sync iPhone contacts through iTunes by IosdroneD. Bookmark the permalink.